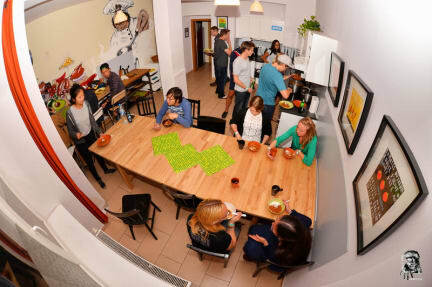 We've designed our hostel for backpackers, with a bunch of friendly international staff who will do their absolute best to assist you in any way possible. They like to refer to themselves as 'professional party people', but they won't just party with you until ridiculous hours in the morning. Our staff are highly knowledgable about the city. They'll cook dinners, point you in all the right directions, show you around during our daily activities and even help you book bus tickets to your next destination. Nothing is too much for us to handle. The Rave Cave (our bar): Start your night with other backpackers and enjoy some good beats and cheap drinks before we take you out clubbing. Outdoor areas: If you feel like escaping the busy city life, you can relax on one of the balconies, patios or in our beautiful garden. As the New York Times says, Prague's Zizkov district is for the young and adventurous.The Zizkov area boasts the most bars, clubs, cafes, pubs and restaurants per square metre in the entire country. Staying with us means you're staying in the cheapest area of Prague - so if you like to drink or like to eat, staying here will work wonders on your wallet. You can walk to the Old Town in around 15 minutes, or catch the round-the-clock tram a few stops directly into the centre. Отличные ребята!!! Жили 6 чел и один ребенок.Всё понравилось!! !